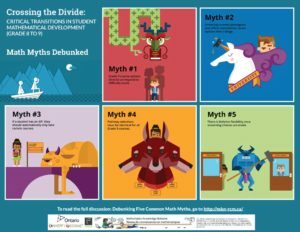 Crossing the Divide: Critical Transitions in Student Mathematical Development Gr 8-9 (September 2018). 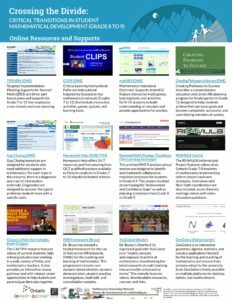 Visit mkncrossingthedivide.ca to learn about Gr 8-9 transition support strategies, math myths, and online resources and supports! The following infographics are featured on the website for download (click to enlarge). 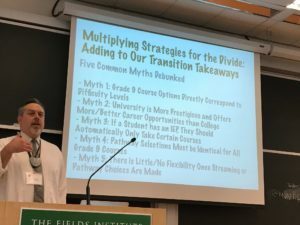 20 March 2018: Crossing the Divide: Exploring Critical Transition Issues from Grade 8-9 Mathematics; Held at the Fields Institute; Lead by Dr. Daniel Jarvis, Critical Transitions CoP member and Professor at the Schulich School of Education, Nipissing University. Further details, slides, and presentation recordings available here. Mathematicians in the Crib. 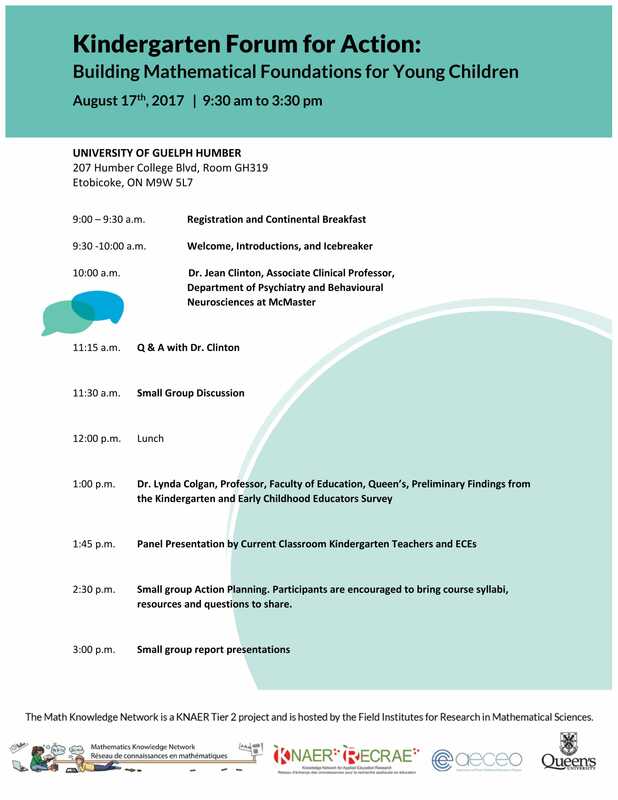 Presentation by Dr. Jean Clinton (McMaster University) at the Critical Transitions CoP’s Kindergarten Forum for Action (August 2017). Watch the video, find related resources, and share your thoughts! 28 October 2017: The Aesthetics of Mathematical Modelling for the Classroom; Dr. Peter Taylor (Queen’s University, member of Critical Transitions CoP) presented his Math9-12 work at the Fields MathEd forum. Watch the presentation here. Math9-12 Project Website. A research-based study designed to bring new life to the high school math curriculum, lead by Dr. Peter Taylor, Professor of Mathematics and Statistics at Queen’s University, and member of our Critical Transitions CoP. See the Math9-12 projects on their website! The Kindergarten Forum for Action included a wide range of participants. See details in the infographic below! The objectives of this CoP focus on transitions proven to be challenging for students. The theoretical framework underpinning this CoP is critical praxis. Drawn from Tilleczek (2012), critical praxis “denotes critique and interrogation of the theory and practice surrounding childhood transitions”(p. 13). The objective of the critical praxis, and of this CoP, is to enhance the experiences of young children by inspiring “schools and people to function as communities which build bridges between students, parents, teachers, and communities” (Tilleczek, 2012, p. 17). 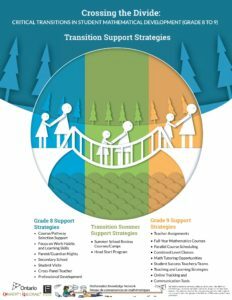 Critical transitions include grade transitions (into formal schooling, kindergarten to grade one, grade eight to grade nine, etc. ), transitions into learning environments (i.e., for new Canadians, language learners), and transitions into learning contexts that enhance opportunities for special needs learners. The outcomes of this CoP will include ways to engage with “family support programs, child care and other early inquiry-based-programs” (KNAER, p. 16). We envision that this CoP may have subgroups with different foci. Supporting diverse learners and simultaneously developing teachers’ mathematical content knowledge are the primary objectives of this CoP. Dr. Lynda Colgan (Queen’s University), Dr. Daniel Jarvis (Nipissing University), Dr. Peter Taylor (Queen’s University), Dr. Ann Kajander (Lakehead University), Dr. Sandy Youmans (Queen’s University), Dr. Donna Kotsopoulos (Huron University College), Dr. Angela Pyle (The Jackman Institute of Child Studies, OISE), Anne Wright (Simcoe County DSB), Sharon Johnson (Greater Essex County DSB), Angeline Humber (Greater Essex County DSB), Patti Oshar (Greater Essex County DSB), David Stock (Kingston Collegiate and Vocational Institute, Limestone DSB), Lyndsay Macdonald (AECEO), Wing-Yee Hui (Toronto DSB), Edward Schroeter (KPRDSB), Carolyn Mussio (LDCSB). WHAT ARE CRITICAL TRANSITIONS IN MATHEMATICS LEARNING? Our Community of Practice (CoP) focuses on the specific stages along the mathematics learning continuum that mark dramatic changes to curriculum, instructional and assessment. These transitions are traditional milestones along the pre-Kindergarten to post-secondary pathway that is travelled by most Ontario students. The first critical transition occurs between birth and Kindergarten. Over the past thirty years, numerous studies have identified associations between a family’s economic, educational, social, emotional, and parenting resources and practices; and increased likelihood of cognitive delay, behavioural problems, and undesirable life-course outcomes for children. There are, however, early childhood intervention projects that have shown an ability to influence family risk factors in a way that improves children’s outcomes specific to mathematics development and learning. This CoP will focus on developing and sharing resources that support mathematics learning at home and in daycare facilities so that children have opportunities to experience important mathematical concepts and become familiar with key mathematics vocabulary in the years leading up to Kindergarten. We believe that mathematics is best taught at both home and at school and that parents/guardians and teachers can work together to make mathematics a fun part of every preschooler’s day. 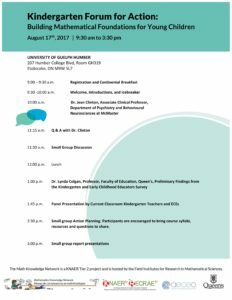 Our starting point will be to disseminate practical strategies identified by research regarding early mathematical acquisition. 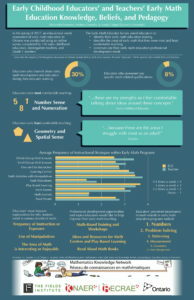 To this end, we will emphasize how important it is to understand and respect how preschool students naturally explore and experiment with mathematics concepts, and how, with this insight, we can employ effective strategies and tailor experiences and instruction that will propel them towards success. The second critical transition occurs between Kindergarten and Grade 1. During the Kindergarten program in Ontario, children experience play-based learning. Young learners’ future understanding of mathematics requires an early foundation based on a high-quality, challenging, and accessible mathematics education. 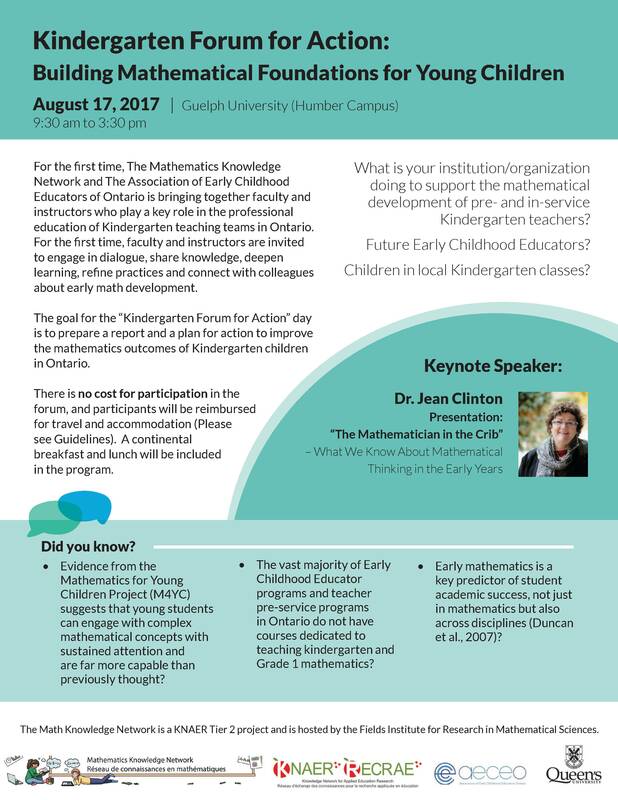 Kindergarten students should experience mathematics through effective, research-based curricula and teaching practices. Such practices require that teachers and early childhood educators have the support of policies, organizational structures, and resources that enable them to succeed in this challenging and important work. To this end, this CoP will share research, resources and opportunities for Kindergarten teaching teams and Grade 1 educators with the goals of ameliorating the alignment between the Kindergarten and Grade 1 curriculum documents and facilitating the transition from a play-based learning environment in Kindergarten to the upper the Primary Division grades where mathematics learning is more inquiry-based and formally assessed. For the purposes of this CoP, the third transition of focus is the one between elementary and high school. The transition from Grade 8 to 9 is a challenging and, at times, overwhelming experience for many students. This transition has been recognized as a stumbling point for many students, and particularly for those who are at risk of leaving school early. For example, the movement is commonly associated with a dip in academic achievement and an experience of increased social anxiety. For students at risk, the experience of transition can be even more problematic. Research-informed recommendations may facilitate the transition: for example, students state that they need more accessible information in the final years of elementary school about high school courses, programs and expectations. To this end, we will work to demystify the course pathways that are available in mathematics throughout secondary school and emphasize the importance of choosing a path that includes sufficient and appropriate levels of mathematics in terms of course selections and student career planning. We will share information from recent studies that highlight the high cost of dropping mathematics in the senior years of high school, and will provide a synthesis of effective strategies for supporting students in their transition from Grade 8 to Grade 9 mathematics study. The fourth critical transition, a specific subset of the third, seeks to support students, parents/guardians and teachers who are associated with Locally Developed Grade 9 mathematics courses. The goal of the Grade 9 Locally Developed curriculum is to decrease mathematics anxiety and increase basic mathematical knowledge through engaging and practical lessons for students who are several grade levels behind. This CoP will share resources and strategies that will allow teachers and students to focus on areas in need of development in order to move forward and enrich the learning experience presenting the relevance of mathematical skills. To this end, the CoP team will work to consolidate resources (diagnostic assessments, creating ready-to-use resources) and share best practices in order to develop the students’ cognitive mathematical ability, an appreciation for real-life mathematical applications, and the conditions for moving on in secondary mathematics to meet the pre-requisites for apprenticeship, college and university. The fifth critical transition will support the transition from secondary to post-secondary mathematics. Project Math9-12 will focus on knowledge mobilization by sharing curriculum materials that are designed to bring new life and sophistication to the high-school mathematics curriculum. The goal of this critical transition team is to develop and share curriculum units that are developed and field-tested by taking mathematical ideas at the undergraduate level and engineering them so that on a technical level they cover a unit of the prescribed secondary curriculum. In this way, the CoP team addresses an issue that is increasingly noted in first-year university mathematics courses: that many, perhaps even most students are not prepared at a conceptual level for university mathematics. At each grade level, there will be three phases: (a) curriculum development: work with students and teachers in a series of intensive sessions; (b) preparation of curriculum materials: teacher manuals, student workbooks, videos and software; and, (c) field testing: documentation of teaching activity and student learning. 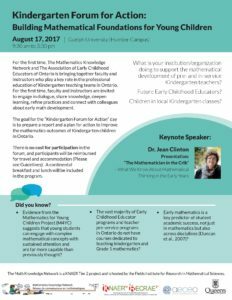 Collectively, this CoP spans the pre-K to post-secondary mathematics development path for Ontario students, and focuses on the key transition points between divisions that demarcate significant challenges to continued student achievement in mathematics. For more details, see the Critical Transitions Implementation Plan Document.